As we go speeding into another month, It’s time for the new poster for July, after a monsterific month in June, what does July have in store? As you can see, Paris, Paris and just a little bit more Paris. I’m quite a big fan of the older Paris pins and I do hope they stay around. If I had to criticize these new pins, I’d say that there is more to Paris than the Eiffel Tower, but I actually like them. The Dumbo pin is a 600 edition and I expect to see this sold out in one day, it’s a beautiful design. A rare Friday release to celebrate the first anniversary of the World of Disney store, personally I don’t understand the thinking behind this one, but it’s a lovely looking pin. The following day, another big release as we head towards the end of the Princess locket series (Just snow white to go!) and the Cinderella good luck/bad luck pin which I think will be a spinner. More princesses in the form of the continuation of the carriage pins. A stamp set to celebrate the city of Paris yet again looking to me like the idea here is to replace the current 20th anniversary stamp lanyard set. 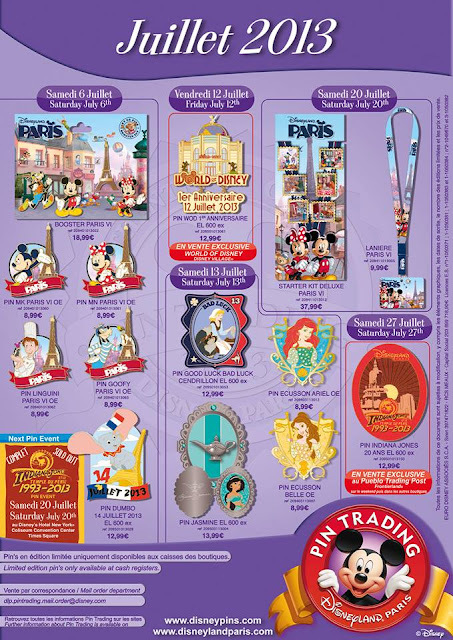 Finally, the jewel of the month to me is the Indiana Jones et le temple du péril anniversary pin. This one looks beautiful. If you have tickets to the Indiana Jones event, have a great time!